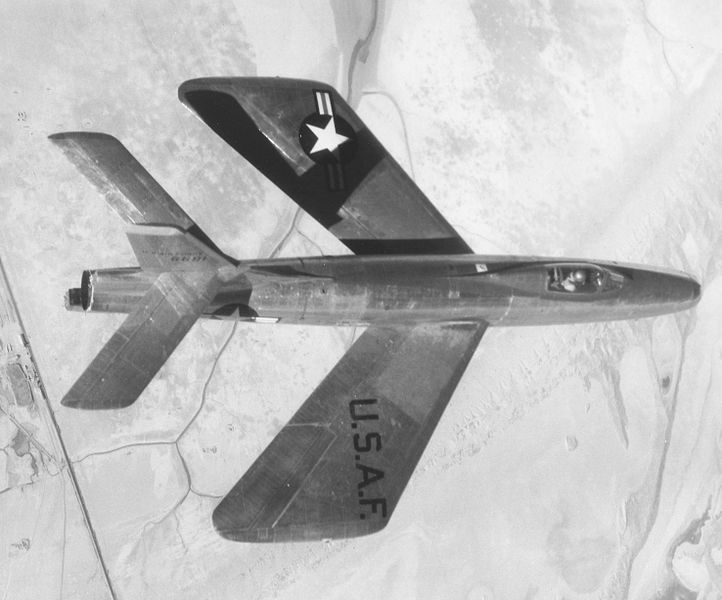 On this day in 1949, the Republic XF-91 Thunderceptor made its first flight. The Thunderceptor was unique in that it was a dual-propulsion aircraft. In normal flight it was powered by a jet engine and it also carried a cluster of four small rocket engines for added thrust during climbing and interception. By the time the design was completed advances in jet engines made the design obsolete and only two prototypes were produced. It was one of these prototypes that was the first US fighter to exceed the speed of sound in level flight. A unique feature that makes the aircraft instantly recognizable is the odd wing design. The wings had much greater chord at the tips than at the root (in other words, they were wider at their ends than they were where they joined the fuselage). This design was an attempt to address the problem of pitch-up which plagued early high-speed aircraft designs. The design of the wings mean that the entire wing would stall smoothly, much like a conventional straight-wing aircraft. Of the two prototypes built, one was destroyed in 1951 during testing and the other is on display in the Research And Development Gallery at the outstanding National Museum Of The United States Air Force in Dayton, Ohio. On a note not entirely related to this aircraft, if you haven’t visited the National Museum Of The United States Air Force you’re doing yourself a disservice. I visited it in 2012 with my Dad and son and even though we spent a full day there we didn’t even scratch the surface of the displays. I HIGHLY recommend you go there. That wing shape sure is surprising! I’ve scheduled visits to just about all the museums within two days drive of Cincinnati for visits across June and July while shooting for Military Photography / Military Media. This jet, I’d never even heard of, so thanks for sharing!! One of the more notable displays they have is the B-29 “Bockscar”, which is the aircraft that dropped the atomic bomb on Nagasaki.